When I left this morning for work, I had to dash to keep from getting rain-soaked. With my knees, dashing is not as simple as it once was. But I dashed. The rain stopped, but the clouds remained. At lunchtime, they had "Art in the Park." The kids in the drama class did a one-act play in the courtyard. After the play, they had some kind of dancing competition. I could tell at a glace that these kids didn't have issues with their knees. I stepped outside and looked at the art and photography exhibits. After lunch, I had a full schedule of coaching. At quitting time, I snapped my laptop closed, cleaned off my desk, and headed home. 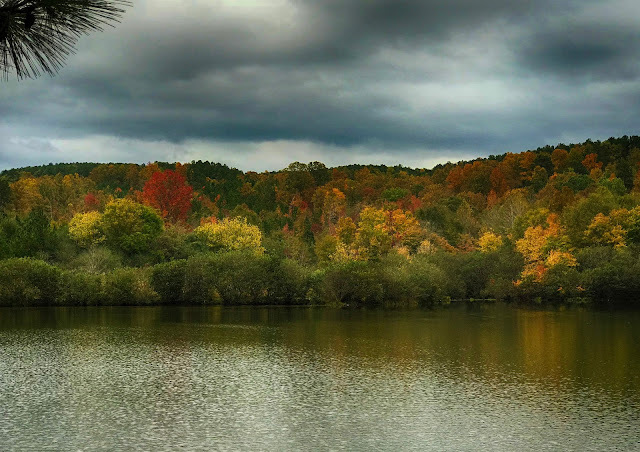 A short detour took me by the lake for a foliage check. It's not peak yet, but it won't be long. I snapped a picture. I tried to get a photo of the fish I mentioned last week, but they were shy today. My dash was never fast and is now painfully slow (but not as painful as speeding up). Love the lake, and am looking forward to further photos as it starts to blaze. What a dashing fellow! You also caught some pretty color, dashing or not. Natures art is the best of all. The picture is wonderful. Regretfully, bad knees restrict my dashes to the written word. Can't wait to see pictures of "full" foliage. It's hard for me (or anyone) to dash with a cane!! You picture looks unreal it is so lovely. Dash away, dash away, dash away all... It was raining here too and I had to dash away too. What a priceless beauty this photo is. Our leaves are almost all gone now and the Fall splendor is finally gone except a few hardier trees and bushes. Homefolk Media. Powered by Blogger.